In Les Misérables (the new movie, the Broadway play, and the book) people boldly and courageously wave and carry a revolutionary flag. Perhaps it’s time to boldly carry and wave an even more revolutionary flag — a Christian flag. Why are national flags prominently displayed on buildings, flag poles, and homes, all around the world, while Christian flags are stuck in dark corners of church buildings? Perhaps its time to take Christian flags out of church buildings and into the light, by: * flying them on flag poles; * hanging them on our houses; * flying them on our cars; * and carrying them down public streets. Flags are powerful symbols, full of meaning. A flag can stir hearts to great heights. The simple sight of a flag can move someone to tears of joy; give great hope, and/or produce amazing courage. Flags also proclaim information. The colors and designs on a flag broadcast strong messages. Special flags (known as battle flags) have been used in warfare for centuries. In medieval times, knights carried flags into battle to identify themselves, because their armor all looked the same and it was hard to know who the knights were without a flag! Thus, flags helped knights tell their enemies from their friends. “In camp and on the march, their regimental flag represented the soldiers’ home, state, and nation. In battle, it served as a communication device for commanding officers and provided soldiers with a rallying point for organizing a charge, defense, or withdrawal. Because of this, enemy fire often concentrated on the soldiers carrying or defending the colors, and if a color-bearer fell, another soldier quickly seized the flag and held it high. Planting one’s colors on enemy-held ground symbolized victory.” — Quote From The Minnesota Historical Society webpage. Since the New Testament describes Christ-followers as an army engaged in spiritual warfare, the church even has flags. A universal Christian flag was developed in the early 20th century that is white with a blue field containing a red cross in the upper left hand corner. The red stands for the blood of Jesus, the white for purity and surrender to God, and the blue for sincerity. This flag is displayed in churches of many denominations. 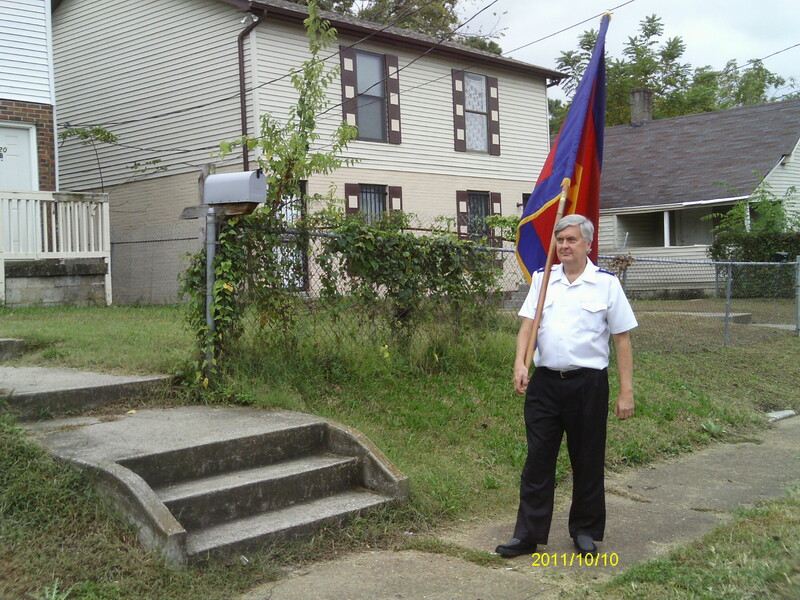 Another Christian flag is The Salvation Army Flag. It was first unveiled in 1878 in Coventry England. It contains the words “Blood & Fire” in a yellow star. The star is in a large red field. The red field is surrounded by a blue border. The red stands for the blood of Jesus and the yellow for the fire of the Holy Spirit. The blue represents living a pure life of following and obeying Jesus Christ. There’s a spiritual battle raging! Let’s plant Christ’s colors outside the building and on the streets of our cities! This entry was posted in armor, books, Broadway play, Christ followers, Christian, Christian history, Christian values, Christianity, church, church buildings, flag, flag pole, homes, Jesus, Jesus Christ, knights, Minnesota Historical Society, movie, New Testament, prayer walking, revolutionary flag, soldiers, special flags, spiritual battle, spiritual combat, spiritual walk, spiritual warfare, the colors, The Salvation Flag, universal Christian flag and tagged battle flags, Christian flag, Fly the flag, history of flags, Les Miserables, national flags, Rally 'round the flag, religion, religious flags. Bookmark the permalink.